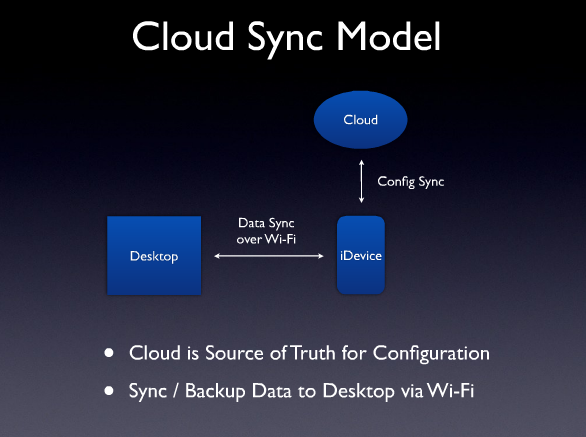 iOS Cloud Sync Coming Soon? iOS Cloud Sync Coming Soon? Sorry – I don’t know if it is. I’ve been reading up on iPad 2 reviews and I don’t know if Apple is following these, but it is repeatedly mentioned that lack of iOS Cloud Sync is Achilles’ heels. Apple needs to take Apple-like approach and start from scratch on iPad 2 first-time-use experience. You don’t want your users to plug this new device to a computer and have them go through laborious hours upgrading iTunes, backing up data and then sync’ing to the new device. Over the next several days, I am going to capture the definition, design, and planning slide decks on iOS Cloud Sync’ing. What do you think? If you think Apple should do this, please fb-share and tweet this! Next Amazon.com Login Form – Bad Design?